Doha, Qatar – 12 January 2016: Qatar Petrochemical Company (QAPCO) Q.S.C., one of the leading petrochemical powerhouses in the region and a pioneer in petrochemical production, received the Award for Energy Efficiency in the Public Sector category from Emirates Energy Award (EEA). QAPCO was recognized for the significant operational efficiency gains resulting from its manufacturing facility upgrade. QAPCO was awarded for its accomplishments in the energy efficiency field, achieved in particular through upgrade of its cracking furnaces. Having been established in 1974, QAPCO makes continual and strategic investment in environmental improvements projects through technological solutions implementation and regular plant upgrades to elevate its overall performance. With the successful completion of the furnaces replacement project, QAPCO improved its operational efficiency and realized significant energy savings, including reductions in energy consumption along with major decreases in Nox, Sox and general emissions. Dr. Mohammed Youssef Al Mulla, QAPCO’s Managing Director and CEO, commented on the award by saying, “Thanks to strategic investments in highly efficient machinery, and through the unwavering commitment of the company to put sustainability in action everyday, QAPCO has achieved significant progress on its environmental performance since 2011, resulting for instance in a 57% reduction in flaring, 30% reduction in NOx intensity, 19% reduction in GHG intensity and a 34% reduction in energy intensity. Our teams have been focusing on realizing energy efficiency gains, as we believe resource optimization is essential, now more than ever. We are thrilled to have received this prestigious award, which epitomizes our commitment to sustainability”. The Emirates Energy Awards is biannually organized under the patronage of His Highness Sheikh Mohammed bin Rashid Al Maktoum, Vice President and Prime Minister of the United Arab Emirates and Ruler of Dubai, the EEA is a regional prize awarded every two years to encourage the rationalized use of energy and resources. The award aims to highlight best practices and pioneering work in energy efficiency, alternative energy, sustainability and the protection of the environment. 112 innovative projects from 12 countries, including the UAE, Saudi Arabia, Bahrain, Oman, Qatar, Morocco, Kuwait, Jordan, Egypt, Iran, India, and Germany, were assessed for the 2015 edition of the EEA held under the theme “For a Sustainable Future”. 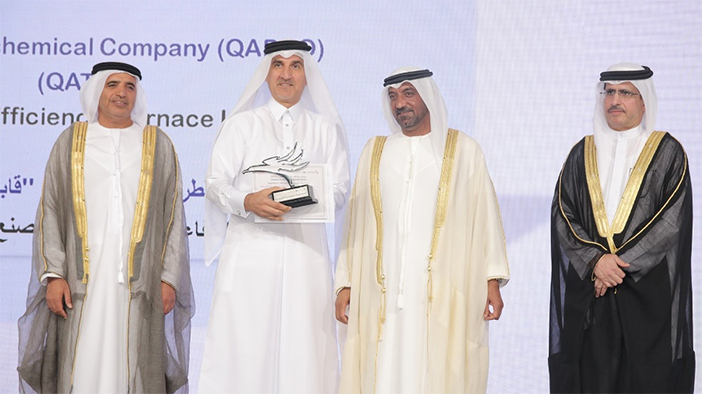 Commenting on the award, Mr. Yousuf Abdulla Rebeeh, QAPCO’s Chief Operations Officer said, “The safe and successful completion of our furnaces replacement project was a significant milestone for our operations. Rigorous management and oversight of our environmental impact is fundamental to our ability to operate responsibly. Our facilities are now more sustainable than ever before and paving the way for a new era of operational excellence.“ He also underlined, “With our furnaces replacement, QAPCO reduced its total energy consumption by 2.1 Million GJ/annum, compared to the overall petrochemical complex consumption of 20.8 Million GJ/annum. Plus, the lower firing requirements of the new furnaces generate 58 Million Ton/annum less Co2, and the improved burner design generates 253 Ton/annum less NOx. I thank all the teams who contributed toward this project and outstanding performance”.